Yogyakarta is one of special regions in Indonesia. Located in the south of Java, Yogyakarta which population is less than 135.915 souls, becomes one of the popular tourism objects in Indonesia. Because this region is led by a king for its government system, DIY is well known of its cultural life. The government in Yogyakarta is centered in ‘Kesultanan Ngayogyakarta Hadiningrat’ (Yogyakarta Palace). The king is called Sultan. Yogyakarta develops with a lot of cultural civilization. It has various potential culture, physical culture and non-physical culture. Non-physical culture is called the norm. Norm is the rule which established long time a go by a social agreement. It is non-binding rules to manage the habit of a certain local inhabitant. In Yogyakarta, the people strongly uphold the Javanese norms that still exist. Here, we would expand the ten norms in Yogyakarta. Most of the norms come from several Javanese Myths. In Keraton, there are several gates. These are the main door for exit and entrance the palace. 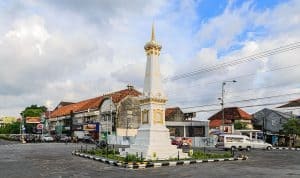 One of them is Plengkung Gading gate which is located in the south of ‘Alun-Alun Kidul Yogyakarta’ (South Public Square of Yogyakarta). The function of this gate is the only one to exit for the death king and going to be buried in kingdom graveyard. That’s why, during Sultan’s leading, he must not pass Plengkung Gading. Parangtritis beach is the famous place in Yogyakarta. Because it has beautiful nature, this place is always full with many visitors. The famous norm in Parangtritis is the visitor should avoid wear green clothing. If you have ever heard the myth about Nyi Roro Kidul, you will understand why you shouldn’t do it. Nyi Roro Kidul is one of invisible creatures who inhabit Pantai Selatan Jawa (the beaches on the south of Java). Nyi Roro Kidul likes the green color. It is believed that she hates anyone wearing green clothing in Parangtritis. There is an intersection in Palbapang village, Bantul, Yogyakarta. There is the unique which the groom and bride should not pass the intersection without any requirement. If a groom and bride want to pass this intersection, they have to let go of the rooster. Some people choose to pass another alternative way to avoid Palbapang intersection. Not only bride and groom, but also the sick people should avoid this way. It is believed that the groom and bride will get some bad luck during their life. Kasuran Wetan and Kasuran Kulon are the part of Margomulya village in Sleman, Yogyakarta. The people in Kasuran never sleep on mattress. Historically, it is because Sunan Kalijaga, a propagator of Islam, visited this place. He said when there is a time to pray, the people should leave the bed and not to be lazy to do a prayer. Since then, the people in Kasuran Wetan and Kulon do not to sleep on the mattress. The visitor of this place must follow the rule too by not sleeping on the mattress. The people in Gunung Kidul Yogyakarta, they must face into southward when chopping the sambal (Indonesian chopped chili sauce). This norm has already been applied hereditary up to now. The people enforce the rule to honor Nyi Roro Kidul. Although Batik parang is aready well known in abroad, you should not wear it when you visit in Keraton Yogyakarta. Not much people know this rule. When you visit Keraton, don’t wear clothing with Batik Parang Barong motifs. Batik Parang Barong is just worn by the palace official in Keraton. That is why you should avoid wear batik with this motif. There is a unique norm in Kregolan Village, Sleman, Yogyakarta. If you want to build a home in this area, you should not make a fence with it. This rule is already well known in Kregolan. The people of Kregolan believe that fence could separate the relationship among the people. With the fence at their house, they could not freely visit each other. That is why the people of Kregolan ban the building of fence. There are three complex of temple in Yogyakarata, those are Prambanan, Ratu Boko, and Borobudur. If you are woman and going to visit those three places, avoid wear any mini pant or skirt. The local government has established this rule since 2013. They suggest wear Batik clothing when visiting temple. The prohibition of wearing mini skirt or pant is aimed to keep the polite normality in Yogyakarta. To support this rule, they facilitate Batik Shawl for the visitor to wear before they enter the complex of the temple. There is a mystical place near the peak of Mount Merapi. It is called Pasar Bubrah. It is located one meter before the top of the mountain. The tracker usually will stay for a night in Pasar Bubrah to take a rest. It is believed in Pasar Bubrah is the place of the crowds for invisible mystical creature. If the tracker could not keep their habit, those creatures would start to disturb them. There is a place in Sleman called Dusun Beteng which consistently uses wooden material for their house. They ban the concrete wall in building a house. They believe that the concrete wall could cause the bad luck for them. That is why they choose to use wooden wall. Those are the ten norms in Yogyakarta. If you want to visit Yogyakarta, you may follow these norms or you may not. However, you should remember that the people in Yogyakarta is always follows its traditional norms and never leaves it. If you want to know more about Yogyakarta, you have to visit Top 20 Culture of Yogyakarta.